Bright, spacious and comfortable are just a few ways to describe the two new residence halls Florida State University will open this fall — providing contemporary on-campus housing opportunities for more than 900 students. 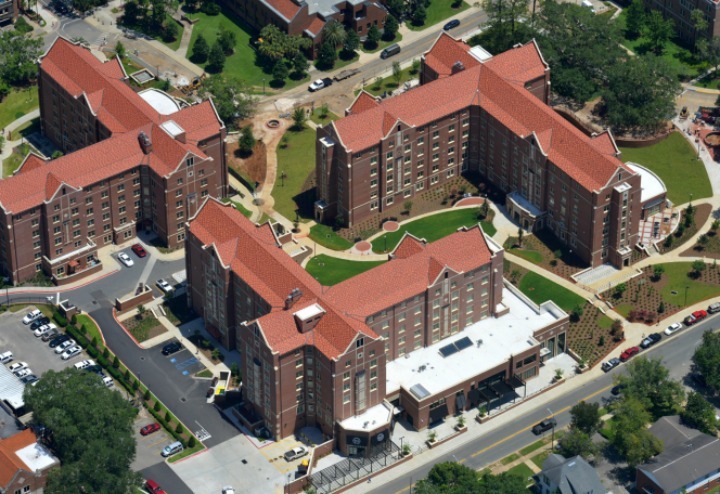 The two new halls, Magnolia and Azalea, complete a quad of four new residence halls, joining Dorman and Deviney halls, which opened in 2015. The four halls face each other, creating an open courtyard area with benches and porch swings where students can relax and enjoy the outdoors. The courtyard’s pathways also provide students with a convenient route to class. “The level of quality and attention to detail in these new residence halls really shows Florida State’s dedication to providing students with superior places to live,” said Shannon Staten, FSU’s executive director of university housing. Though some of the new residence halls share the same names as their predecessors that have since been torn down, these halls have come a long way from their old-school brethren. The four six-story brick buildings feature the same type of amenities as apartment complexes, like roomy lounge areas with comfortable seating, flat screen televisions and ping-pong tables, laundry facilities, full-sized kitchens, large study rooms, along with 24-hour staff and maintenance services— all designed to make students feel at home without ever having to leave campus. The layout of the new halls is suite style, with each two-bedroom suite housing four students. The rooms are each furnished with adjustable beds, dressers, chairs, desks and a mini-fridge. There’s a sink in each bedroom with a shared bathroom and shower in each suite. The halls feature amenities designed to serve the needs of today’s students, like outlets for charging electronics built into the colorful chairs and couches, creating a perfect studying environment that’s comfortable and functional. 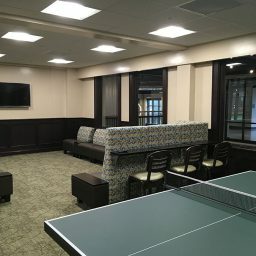 While many of these amenities are in other residence halls on campus, the open layout of the newer halls is unique and promotes a naturally social atmosphere — making it easier for students to bond and form friendships. Located on the ground floor of Azalea Hall, 1851 offers a variety of dining options: Noles’ Homecoming (comfort food); Passport (international/healthy); J Street Grille (American grill); Tuscan Eatery (Tuscan/hearth oven) and The Canteen (a convenience store/coffee shop). 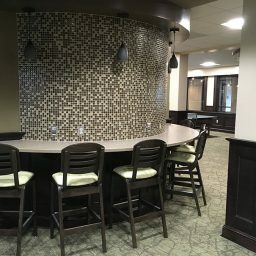 The new dining area is expected to open Aug. 28 and is in a perfect spot for students, faculty, staff and the Tallahassee community to grab a bite to eat for lunch or dinner. Conveniently located on Jefferson Street across from several sorority houses and the FSU Police Department, 1851 connects the residents of Azalea to the bustling campus activity with huge windows overlooking the dining area. While Azalea residents can enjoy the view over the dining area, they are still safe behind locked doors. 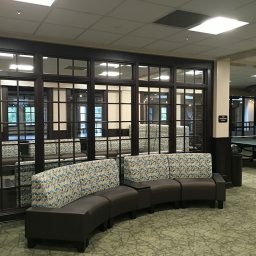 Only a few students had the privilege to stay in Azalea Hall during the summer semester, and were pleased with the new amenities and features the new residence hall offers. The move-in date for all the residence halls is Wednesday, Aug. 23. A ribbon-cutting ceremony to celebrate the opening of Magnolia and Azalea halls will take place from 1:30 to 3 p.m. Wednesday, Oct. 4. “I think by providing students with a quality place to live we are helping put them on the path to success,” Staten said. For more information, visit housing.fsu.edu.